At the beginning of December, Santa and his helper Schmutzli move into a small cottage by the forest pond near the city of Zürich. From here they visit children at their home, which is a continuing tradition in Switzerland where parents call Samichlaus ahead of time. Santa can also be visited at his cozy cottage. For a few days around December 6 – the official Santa Claus day in Switzerland – children can visit Santa in the living room of his forest cottage, where Samichlaus tells them stories from his life and listens to their verses. Meanwhile, Schmutzli, Santa’s companion, looks after Santa’s donkey outside and makes a fire where the children can roast their brought-along delicacies after the visit. 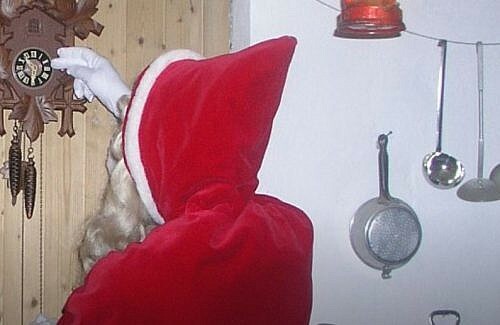 Many children throughout Switzerland wish for a personal visit of Santa and his companion Schmutzli at their home. The St. Nikolaus Gesellschaft in Zürich tries to do justice to all of the requests in Zürich, but due to the number of requests unfortunately has to disappoint some children. For this reason, the Santa phone was initiated many years ago. 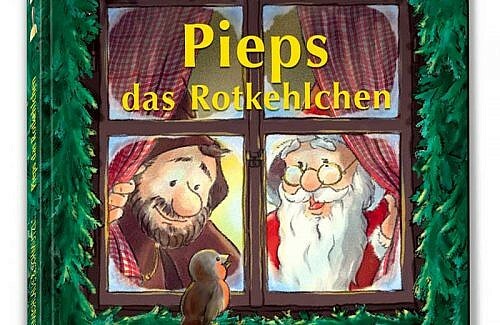 “Da isch dä Samichlaus” (“Here is Santa speaking”) is what the children hear when they call the number to speak with Santa. 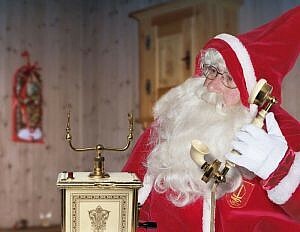 The phone is staffed with specially trained Santas who also have long experience in the field. This is a free service to any child who wishes to speak with Santa, having had a visit or not. The request to refrain from “joke” calls to the widely published number to keep the lines open for the children is honoured quite well by the general public. Since more recent, Santa & Schmutzli can also be reached by WhatsApp and are looking forward to every picture or text message, to which of course they respond promptly. 16,000 letters yearly are delivered to Santa via the official Swiss Postal Service. From within Switzerland, and from around the world. As long as the children include a return-address, each letter will be answered by a specialty team hired for the purpose by the Post. 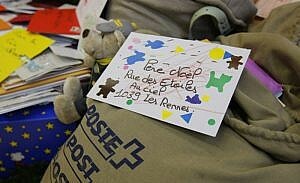 Some letters don’t have a return address, and then the team moves heaven and earth to find «Sébastien, 5» or «Anna Lena, Trueb» via the postal stamp and other clues, so that only about 400 letters remain unanswered. Letters are answered in all of Switzerland’s four languages plus English! 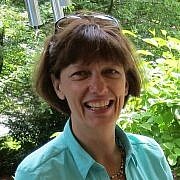 75% of all letters are sent in by children from the French and Italian speaking parts of Switzerland – an interesting piece of information. And what does Santa answer in his letter? It could be a Christmas story along with some coloring pencils or a small game, and occasionally, Santa fulfills an even greater wish. Letters need no postage, but a lovely hand-colored stamp is most definitely noted by Santa! 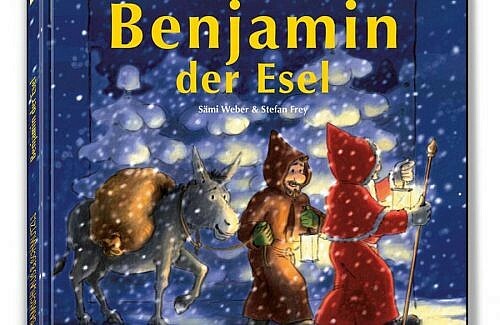 Many books & story tapes such as “Benjamin, the Donkey” – stories about Santa and Schmutzli’s life – can be ordered in support of the services rendered by the Zürich St. Nikolausgesellschaft. (Material available in German only). The Santa Claus Society of the city of Zürich provides many free events/services & brings gifts not just in December but throughout the year to people in need, seniors, the infirm and physically or mentally challenged. Working in close partnership with various societies, it organizes holiday camps for challenged youth & adults and finances other projects. Through their volunteers, the society crafted 1,700 Santa gift bags and baked 1,000 Grittibänz (traditional Holiday bread) to give out free this year. 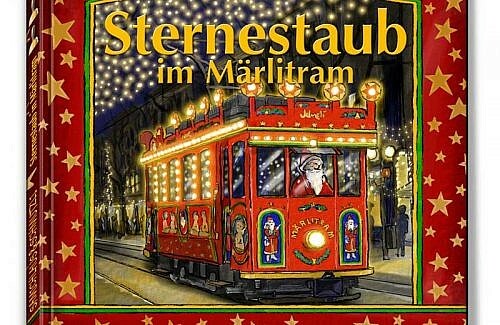 Santa visits are an enduringly popular pre-Christmas event in Switzerland. The benevolent care and sincere interest of Santa in each child speaks about the beauty & benefit of this endearing tradition in Switzerland. Do you know of any endearing Santa traditions? Please share them and leave a comment below!